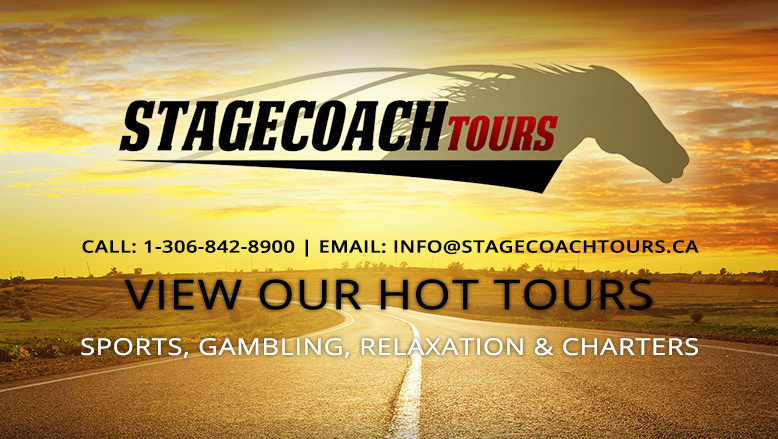 Stagecoach Tours & Charters - Services - Proud to serve Saskatchewan! Are you looking to charter a bus for a sports team, business, school group, senior’s trip or just a group of friends? At Stagecoach Tours we can create and customize travel options to suit each customer, and provide you with a competitive priced quote. We offer pre-planned itineraries to scheduled destinations or can create an itinerary based on your needs. We offer great quality tours! Whether you are looking for a day trip, overnight or multi-day trip, we have a variety of choices to meet your needs. Our tours use some of the finest motor coaches in the industry equipped with the latest amenities to make your travel experience pleasurable. Check out our Tours Section to have a look at our trip listings. Leave the driving to us! Stagecoach Charters provides groups with comfortable motor coaches at a cost that is affordable. Our charter services are ideal for school groups, sporting teams, ski trips, social clubs, and church groups. Contact us to get a quote for your next trip. Looking for transportation to and from work sites, plant or factories? Stagecoach can work with large companies who need to transport employees. Let us come up with a solution customized to your company’s needs. For further information, please contact us. Need hassle free transportation on your big day? Let us get you and your wedding party from your ceremony to your reception. We can also transport your guests. We have motor coaches and mini buses available to groups both large and small. Stagecoach Tours & Charters - Are you looking to charter a bus for a sports team, business, school group, senior’s trip or just a group of friends? At Stagecoach Tours we can create and customize travel options to suit each customer, and provide you with a competitive priced quote.